tags: Juan Cole, Richard Falk, Tsunami In Egypt, What Now Egypt? A time to rejoice. Democracy has won a big one. Geriatric authoritarian kleptomaniacs the world over, take note! The news has broken a few hours ago that Hosni Mubarak refuses to step down as Egypt’s president despite enormous domestic and international pressure for him to do so. This is a dangerous moment with events moving rapidly, although it is not clear towards what. At the moment – U.S. Middle East policy is in shambles, utter confusion with Obama’s key Middle East advisors split over how to proceed. 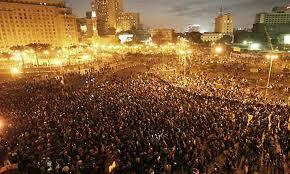 This is a defining moment for Egypt and for the Obama presidency. What I think is going on is `a revolt of the U.S. proxies’… in which Egypt, Saudi Arabia and Israel (a strange, but strong coalition) are making a common stand, and `putting the ball’ back into Obama’s camp. They are challenging him to act understanding that Obama’ options are limited; Their goal is to bring down his presidency rather than Mubarak. It might work. Obama’s options are fraught with problems. Mubarak’s rejection (after hinting that he would step down and getting the international media into a froth) of leaving office is tantamount to challenging Obama to move in the direction of military intervention. But a direct U.S. military intervention would throw the entire region into complete chaos. On the other hand, if Obama does not intervene it would suggest his weakness under pressure. He would find himself in a situation similar to Jimmy Carter facing the Iran crisis in 1979. Whatever, the crisis is shaping up to be the defining moment in Obama’s presidency. He is not handling this situation well. Much depends now on the response of the Egyptian military caught between a rock and hard place. Its upper ranks are closely connected to Mubarak. There is a danger in a split between pro and anti Mubarak factions, a development that could have ominous consequences. Perhaps there are other options that I do not see? Of course, I’m sure there are. Regardless, these next days are going to be an extremely sensitive period. Earlier in criticizing U.S. foreign policy in the Middle East I labeled the current situation somewhere between a set back and debacle for U.S. policy. The diagnosis is leaning a bit more towards the `debacle’ scenario. yes a BIG ONE ’tis!! That fought with us upon St. Crispin’s Day. Perused your piece… won’t delete it, although what I saw of it I don’t much agree with. Still I don’t have time at the moment but I hope in the next few days to look at it more carefully `in the spirit of dialogue’..